Figure 1. Columbus Salt Marsh Project. Google Earth image showing the location of RLC's placer mining claims. 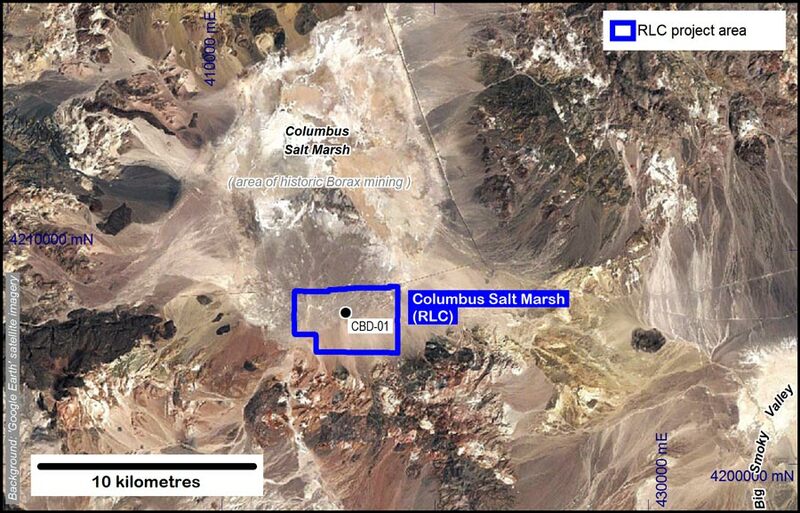 The Columbus Salt Marsh project is located 45 kilometres northwest of Clayton Valley (Nevada, USA). The Columbus Salt Marsh valley represents a closed basin with extensive Tertiary volcanic deposits in the surrounding hills. USGS open file gravity data indicates that the centre of the valley has subsided up to 3.5km. The valley is fault bounded and several geothermal springs discharge alkali salts onto the lake surface. These alkali deposits have in the past been mined for borax.